Cameras for underwater photography which brands? There are two main brands of cameras for which underwater housings are made: Nikon and Canon. So this answers your first question, which camera should I use underwater. FLAAR has Nikon D100, Nikon D300 and staff have Nikon D70, Nikon D90, and D700. But FLAAR also has Canon EOS 5D and Canon EOS-1Ds Mark III. Staff have Canon Rebel T2i. If you have a Minolta (or Sony), Olympus, Sigma, or Pentax DSLR of course there are underwater housings but nowhere near as many. At Photokina 2010, the largest photography equipment expo in the world, there were many booths with underwater camera equipment, especially from China, Japan, Korea, and Europe. Not many American underwater housing companies were represented; AquaTech was one American company present. Obviously there are diving expos where most of the underwater camera companies would tend to exhibit, but since I go to Photokina every two years anyway, this is what I looked at. Neither SEA&SEA, Nexus nor Ikelite exhibited under their own brand name booth at Photokina either. AquaTech was one of the few American companies that exhibited at Photokina 2010. Everyone in the booth was hospitable, even when I started to visit the booth the day before the expo even opened (FLAAR had an exhibit of photos in the area above on the next floor but not far from AquaTech booth. There housings for for a basic range of Canon and basic range of Nikon cameras. They do not make housings for cheap point-and-shoot cameras, and also not yet for the Canon EOS 1Ds Mark III. Be sure that the lenses that you have are covered by a lens port offered by AquaTech. These are housings, to protect the camera from water. A lot of the controls on your camera you need to set before you jump into the water. This makes the housing a more reasonable price. AquaTech offers underwater camera housings for Canon EOS and Nikon D digital cameras. 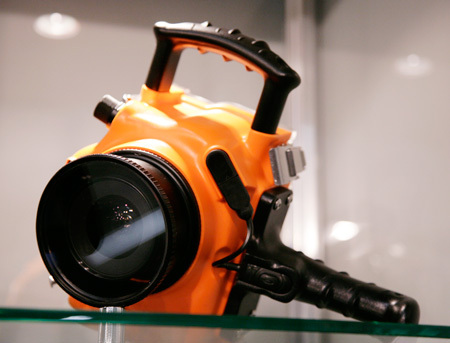 Here are AquaTech underwater camera housings which we inspected at Photokina 2010. Aquatica is headquartered in Montreal. They did not exhibit at Photokina 2010. 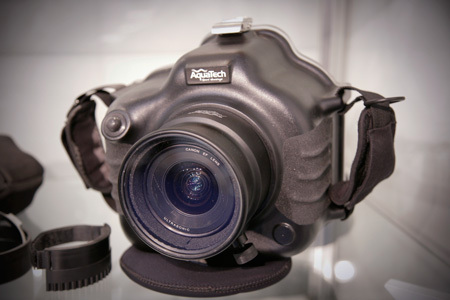 Aquatica makes housings for Nikon D90 and above and for Canon Rebel and also Canon EOS-1Ds Mark III. Epoque World Co., Ltd. is a Japanese company. Their catalog at Photokina 2010 showed primarily underwater housings for the Canon EOS Rebel T2i and comparable recent model Canon Rebel DSLR cameras. My first underwater camera (to �test the waters�) was a Canon PowerShot D10. I am very happy with the results from this $299 camera that does not require any underwater housing whatsoever! So, naively, I figured that if I had an underwater housing and a better camera, the resulting photos would be better than those of the PowerShot D10. After all, when I am photographing on land I use a Canon EOS-1Ds Mark III, Nikon D300, and Hasselblad with a Phase One P25+ digital back. But no, the results of using a Fisheye FIX underwater housing, on a Canon PowerShot S90, were not one iota better than the $299 Canon PowerShot D10. The Fisheye Fix system, with SEA&SEA flash, plus camera, cost about $3000, so TEN TIMES what the Canon D10 cost. And the Canon D10 took photos as good as those of the $3000 system. Plus the Canon D10 was idiot-proof to use. So I fell like I wasted thousands of dollars on the Fisheye FIX system and am not content that it was recommended to me. However the initial photography was in a mangrove swamp along the Pacific coast of Guatemala. The water was murky, and some of the camera settings were not good for use underwater with the lighting system. So we will try one more time in water that is more clear, and with more attention to the camera settings. But with the Canon PowerShot D10, you don�t need to worry about camera settings! It seems to take adequate photos in almost every mode! Fisheye FIX is a Japanese company, with headquarters in Tokyo. Their web site is primarily in Japanese, with some basics in English. Ikelite did not exhibit under their own name as a booth name at Photokina 2010 but their products were visible. Ikelite makes underwater housings for point-and-shoot cameras, indeed they cover most Nikon Coolpix and entry-level Nikon D5000. 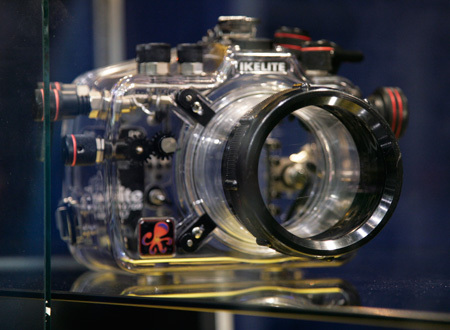 But Ikelite also makes underwater housings for the Nikon D-40, D40X, D-60, D-70, D70s, D-70, D-90, and D200, 300, 300s, and D700. For Canon Ikelite provides a body for the S90, and most point-and-shoot Canon, plus entry-level Canon Digital Rebel including 550D Digital Rebel T2i, then a few of the pro-sumer EOS models, but not the high end Canon EOS-1Ds Mark III. The Ikelite web site provides helpful tips for using digital cameras underwater, especially what settings to utilize. China is an impressive country: they have a better highway system than the USA and more impressive airports than 90% of the major cities in the USA. Nonetheless, it is tough to jump to a Chinese product when so many Chinese products have issues because of low-bid parts and cheap materials. Chinese tires, Chinese printers, Chinese CO2 CNC routers: they all have a reputation of using cheap components. But the rest of the world likes lower priced products, so there will always be a growing market for Chinese products. And there are indeed plenty of Chinese products that do work: the Apple Mac computer that I use to write these reports is contract manufactured in China. It has worked fine for four years now (but all the titanium coloring has painfully obviously worn off the keys on the keyboard that I use the most� an unfortunate example of a material that simply does not hold up to normal usage). Nauticam offers a limited range of underwater housings for Nikon D 90, D300, D300s, and D700. For Canon only 7D and 550D. But for those cameras for which a Nauticam is available, they offer an acceptable range of options. SEA&SEA is a Japanese manufacturer of underwater housings. SEA&SEA and SUNPACK are the same company. I was disappointed that they were not at Photokina 2010. SEA&SEA makes underwater housings for compact cameras (point-and-shoot) and for 35mm DSLR cameras. As with most underwater housing manufacturers, their underwater housings are only for Canon and Nikon cameras. SEA&SEA MDX-series are available for the Nikon D300, D300s, and entry-level Nikon D40, D40X, and D60. For Canon cameras SEA&SEA underwater housings are available for Canon EOS Rebel T2i, T1i and even for the Canon EOS-1Ds Mark III. When we called the camera store, for reasons I do not know, they suggested skipping SEA&SEA and buying a system from Fisheye FIX (which did not impress me other than negatively). This Austrian company exhibited at Photokina. They make a wide range of sophisticated underwater housings for the better Canon EOS and Nikon D-series digital SLR camera bodies. They make a strobecase for Nikon flash units rather than a dedicated undertwater flash. SUBAL provides products at a professional level. They do not make equipment for point-and-shoot cameras. The first potential scam are the sham-review web sites. These are mass produced pseudo-reviews whose main purpose is to rake in money from sales commission paid by Amazon.com or B+H or other photo outlets. I would not mind the sales commission aspect if at least the reviews would list what was an issue with the product supposedly being reviewed. It is tough to find a so-called camera review ethical if the person has not actually used the product in a real-life photography situation. Or at least gone to Photokina and looked at all the competing products. The second sales trick is selling you equipment that you don�t need. The FLAAR Reports prefer to guide you through reality and provide tips of what to be aware of. 2005	Master Guide for Underwater Digital Photography. Amherst Media. Unfortunately anything on digital photography from 2005 is going to be sadly obsolete in most instances. DRAFAHL, Jack 2006	Adobe Photoshop for Underwater Photographers. Amherst Media. Photoshop for 2006 means for 2005 since a book published in 2006 was researched in 2004 and finished in 2005, and that is the Dark Ages compared with what is available in 2010 going into 2011. Obsolete is one polite world.